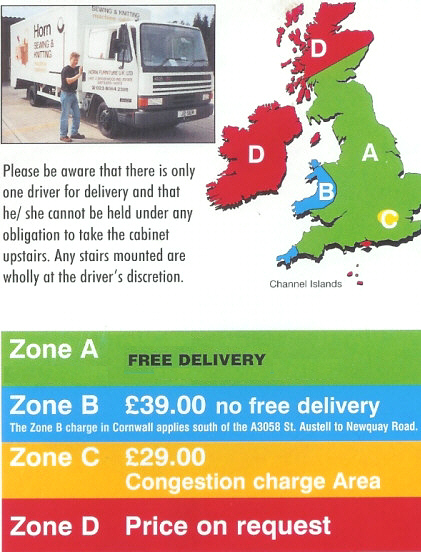 Cabinets are delivered free of charge to most parts of mainland UK, a charge is made for deliveries outside the main area. Sorry we cant ship outside the UK. Our sewing cabinets are delivered and installed ready assembled in your home, setup using our supplied filler insert plate for your sewing machine... ready to sew! Delivery usually takes 14 to 28 days (2 to 4 Weeks) for INSERTS, AIR LIFTERS and EXTENSION TABLES and 14 to 28 WORKING DAYS (4 to 6 weeks) for CABINETS. Delivery timescales can vary. Horn will contact you once your cabinet is complete to arrange delivery. We are in constant contact with Horn furniture so if you need a more specific delivery information, please contact us.